Glossed copy of Eberhard of Bethune's Graecismus, Initial F, Walters Manuscript W.371, fol. 21v, originally uploaded by Walters Art Museum Illuminated Manuscripts. 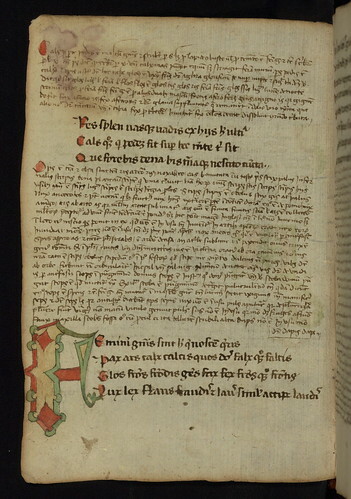 This German manuscript, written on paper ca. 1440, is a copy of Eberhard of Béthune's thirteenth-century grammatical poem Graecismus. The poem is here accompanied by the extensive gloss by Jean-Vincent Metulin, a scholar from Southern France. Having functioned as a textbook, the manuscript's condition suggests it was well-used by students eager to memorize and comprehend Béthune's ideas on the grammatical usage of Greek words. hi,sharing for effective infromation...i would like that for your informative. For abounding online entrepreneurs publishing is a circadian chore. Some broadcast blogs, accessories or ezines to advance their name or that of their businesses and some alike use their wordpress backup computers to actualize printed publications. How is this self-publishing possible? Through desktop publishing. Here are some tips.